Clean room comfy bed. Cleaner was still cleaning room when we arrived though. Overall good experience. Would recommend. 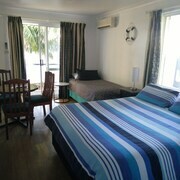 Very Clean Professional welcome - room not tidied/made up after first of two nights - holiday time arrangements? Otherwise excellent facilities. Jobs. Taxes. Learning how to cook things other than 2-minute noodles and frozen pizza. Adulting is hard, so why not head to Busselton? Pick from one of our 11 amazing hotels within 5 kilometres of the action downtown and forget about all those grown-up responsibilities. Planning to paint the town red? Save yourself the late-night cab fares and snag a room at central hotels such as the Amalfi Resort and Comfort Inn Busselton River Resort. 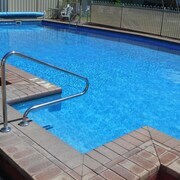 The neighbourhood of West Busselton lies 2 kilometres from the middle of Busselton, and offers 6 hotel options. 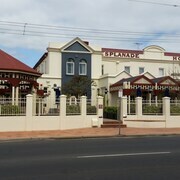 The BIG4 Beachlands Holiday Park and Gale Street Motel and Villas are highly recommended. Drop into Busselton Museum for an interesting lesson in local history. 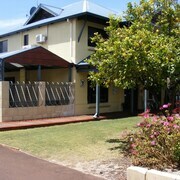 The Busselton Guest House and Observatory Guesthouse should definitely be on your accomodation hit list if you'd like to stay close by. ArtGeo Cultural Complex is a happening cultural centre. Be sure to check out what's going on during your stay. Fortunately, Royal Palms Resort and Jacaranda Guest House are pretty close by, so you can swing by and see it as much as you'd like! Want more options? The Aqua Resort Busselton is located 7 kilometres away from the main central district, and the Bay Village Resort & Spa is 25 kilometres away. The Erravilla Country Estate, 25 kilometres away, and the Abbey Beach Resort, 7 kilometres away, are alternate options. Yelverton is another place where you can sit back and get to know the room service menu. Located 25 kilometres southwest of Busselton, it's where you'll discover the Naturaliste Reptile Park and the Beckett’s Flat. If you're keen to spend a night or two in Yelverton, look into the rates at the Island Brook Estate and Forest Rise. 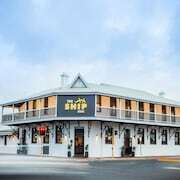 Alternatively, you could stay in Dunsborough, 25 kilometres to the west of Busselton, where you can pick from the Windmills Break and Empire Spa Retreat. Whether you're shooting through or staying in Dunsborough, set aside some time to visit the Flametree Wines and Xscape at the Cape Fun Park. 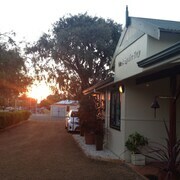 Busselton awaits! 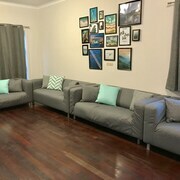 Let lastminute.com.au sort out all the boring stuff while you pack your bags.